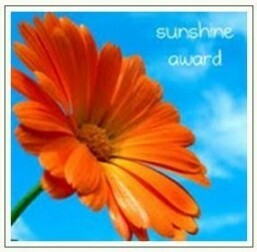 I am honored to have been nominated for “The Sunshine Award.” This award is bestowed to bloggers “who positively and creatively inspire others.” Nominations are given by fellow bloggers who want to share their love by recognizing their favorite bloggers who inspire them in some way. I have had the honor and pleasure to have been nominated by the very talented, Lady Lovely Blogger. From the bottom of my heart, I wish to thank her for nominating me for this honorable award. I have followed her website as it’s very inspiring and uplifting and takes you on a wonderful journey of positivity and love. I am honored to have made her top list of nominee’s and very encouraged that she finds My Soulful Healing an inspiration. Thank you so very much Lady Lovely Blogger. There really is no feeling more rewarding and exciting than being recognized by your fellow bloggers and peers; especially those that motivate you. To anyone that needs a boost of instant love and positivity, I encourage you to check out and follow Lady Lovely Blogger @ ladylovelyblogger.wordpress.com. Pay the love back with gratitude and a link to the blogger who nominated you. Answer 10 questions (listed below) about you. Pay the love forward by nominating 10 -12 inspiring blogs (or you pick the number) you enjoy by posting a link to their page (on your page) and comment on their blog to let them know they’ve been nominated and invited to participate. What is your favorite color? Purple has always been my favorite color because it’s so vibrant and always catches my eye. It is soothing, healing and meditative to me. What is your favorite animal? I am an ANIMAL LOVER!! However, because of my close bonds of pet-ship, I have to say dogs hands down. They always warm my heart and soothe my soul with their unconditional love and acceptance. What is your favorite non-alcoholic drink? Biggest guilty pleasure is Barqs root beer, it gets me every time! Do you prefer Facebook or Twitter? I’m a tweet-a-holic and do not plan on opening a Facebook “Like” page for My Soulful Healing. Do you prefer giving or getting presents? I find more joy in giving than receiving. Some of the people on my nominee list inspire me with their creative writing, some of them inspire me with what they write about and some of them are just all around inspiring people who fascinate me greatly by their brilliance and talent. Overall, they all inspire me in some way! I encourage you all to visit and discover on your own, how they deserve The Sunshine Award because they all positively and creatively inspire! Some have been nominated before for The Sunshine Award but deserve this award again as they continually dedicate their sites to inspire and serve others. Words of Compassion, Creativity, & Knowledge In Michele’s blog, she inspires me with every entry. She is a true spirit of love and light. She takes you on a personal journey of her life through memories, thoughts, feelings, and second chances. She has much talent and is a true survivor and animal lover. I feel connected to her with every word she writes. Into the Heart ♥ In Yamyah’s blog, she takes you on a unique spiritual journey by sharing what is channeled from spirit. She is a messenger & empath and fascinates and inspires me with her intuitive gift and eloquent writing. Several Starry Nights In Shannon’s blog, she inspires me by her youthful, fun and free spirit and perseverance in her life long dream of writing her book. She takes the hard knocks of life and keeps going but with a positive attitude. She is a true artist and supports the Next Gallery Program (You can learn about on her site). Professions for P.E.A.C.E. In Gina’s blog, it’s about musings on life, love and peace. Another popular blog that greatly inspires and she has been nominated by many for this award but for anyone that seeks versatility and motivation, check her out. Don’t forget to check out all these nominee’s and http://ladylovelyblogger.wordpress.com and, if you like what you see, please feel free to leave a comment on their blog. You really make a bloggers day when you leave a thoughtful comment on one of their posts. This entry was posted in Award and tagged Award, nominating, Sunshine Award on 05/30/2012 by My Soulful Healing. suggesting that I extremely loved the usual info an individual supply to your guests?